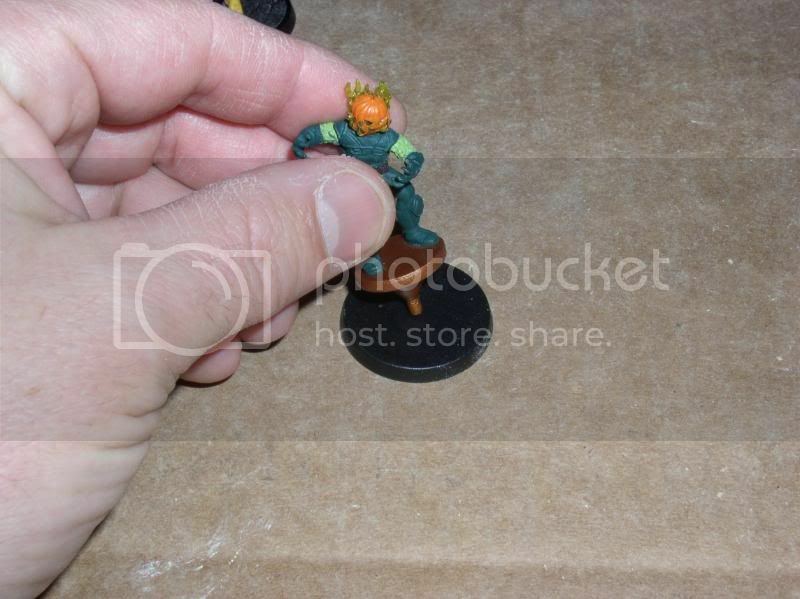 I thought I'd help out and do a little re-basing demonstration with pictures. Now onto the way I re-base. These are my tools of the trade. They can differ from person to person, but this is what I have been using. 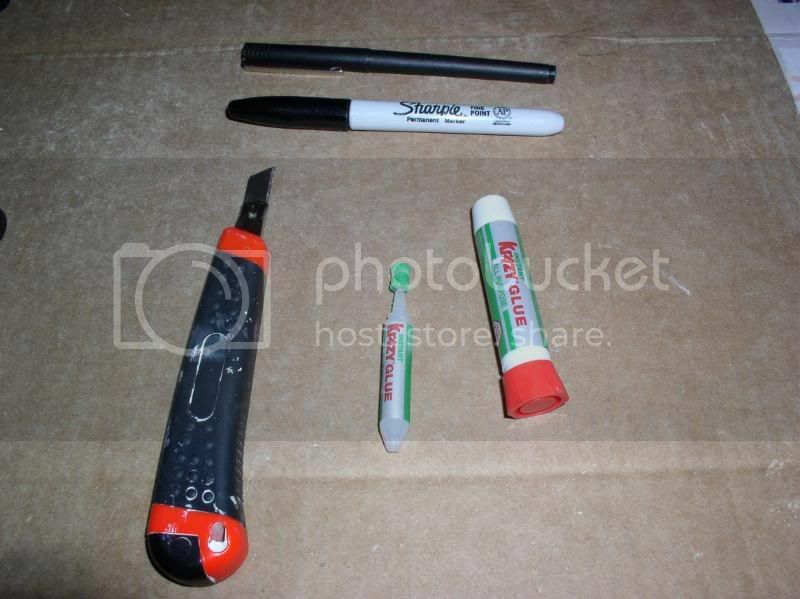 I use a little breakaway razor knife, Krazy Glue, a normal Sharpie and a fine tip black marker. 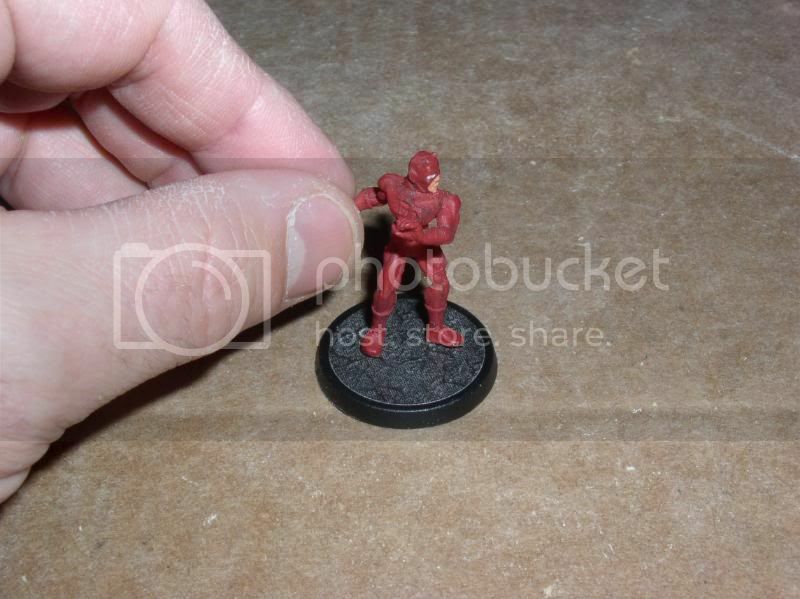 "To prove that we are reliable ... a promise from me to the Heroscape crowd. 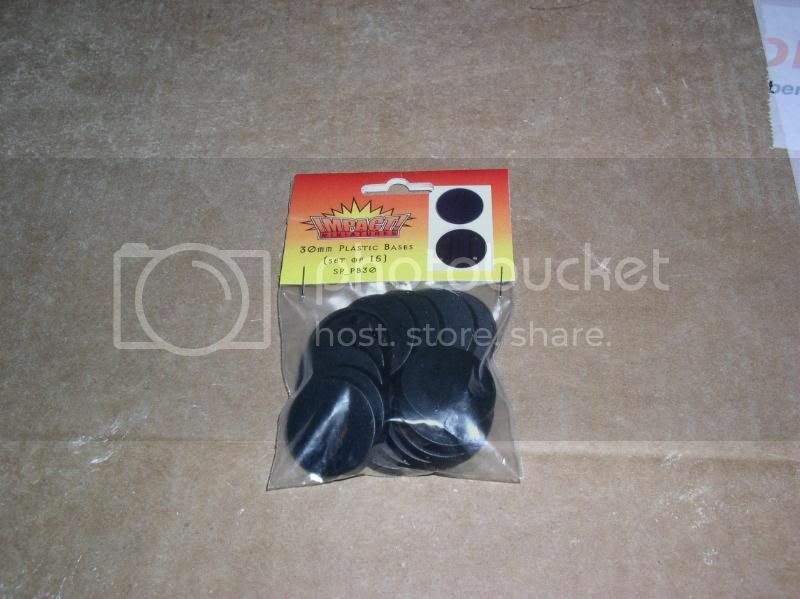 If you are ordering basing material from us ... just drop me an email and say you found out about us from this forum and I'll make sure your order ships out in 4 days or less. 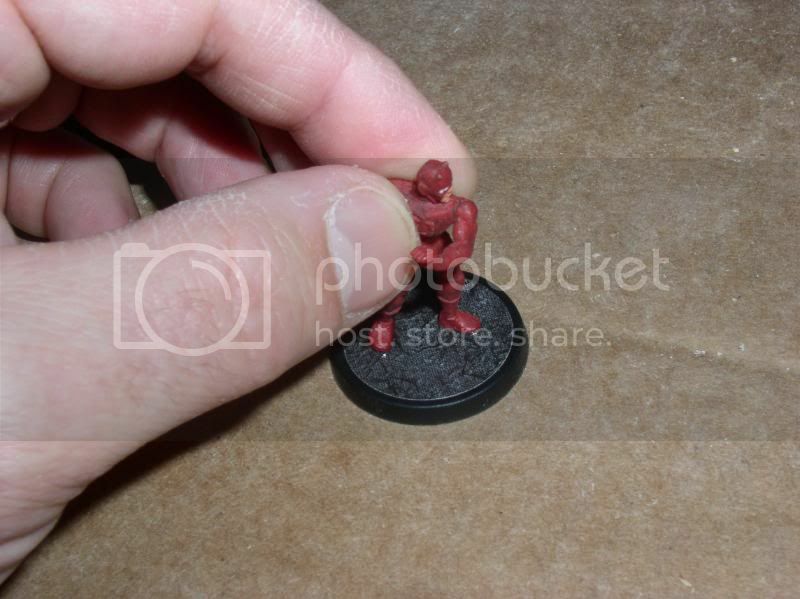 Normally all orders all filled within 7 days ... "
These base stickers were purchased from fellow Heroscapers member, Cavalier. I PM'd him and inquired about them and he told me how to proceed in ordering. I won't quote the price for them at the moment as they may have changed. 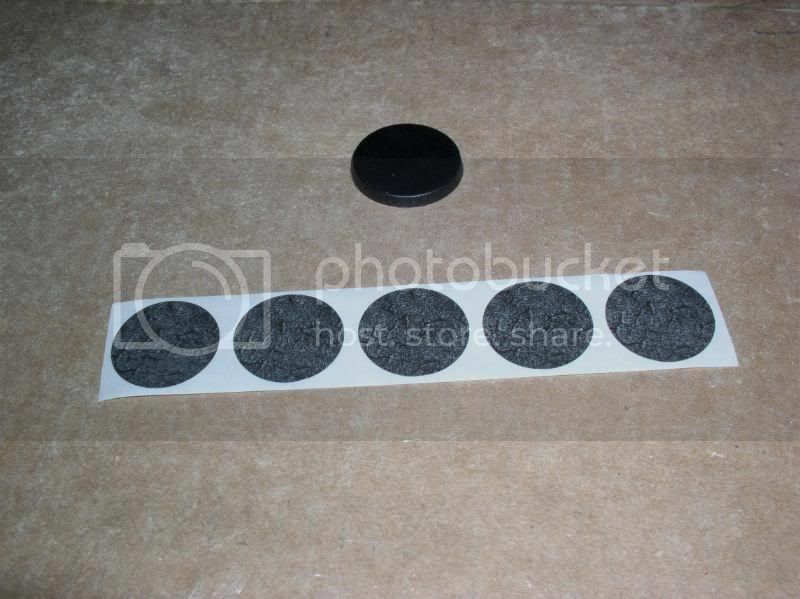 These stickers are easy to peel off and apply to your new bases. 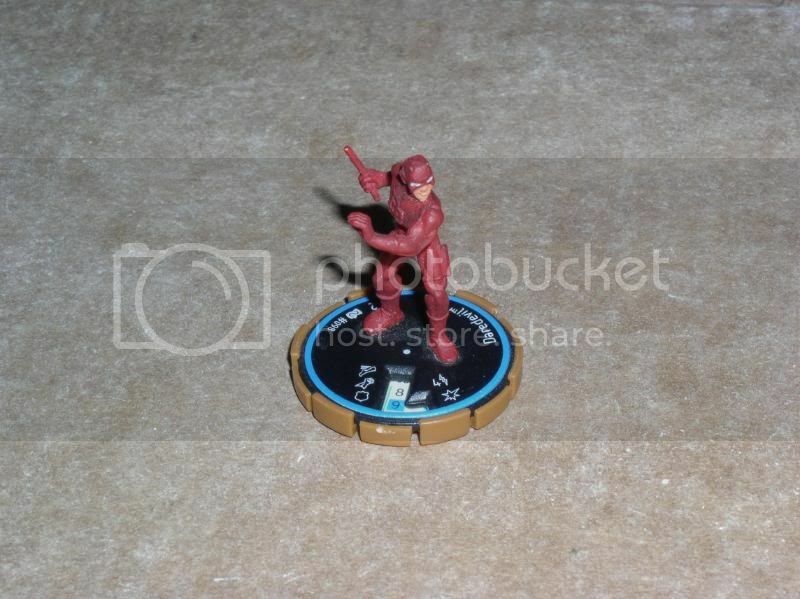 Here is a Heroclix figure that I will re-base. 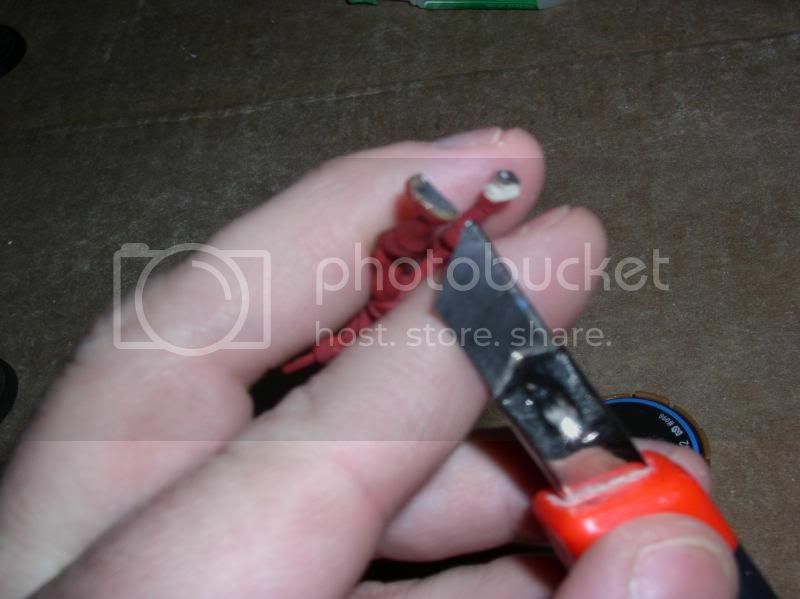 Carefully use your razor knife to separate the figures feet from the current base. I usually try to angle the knife slightly downward toward the base to avoid cutting into the softer figure's foot. 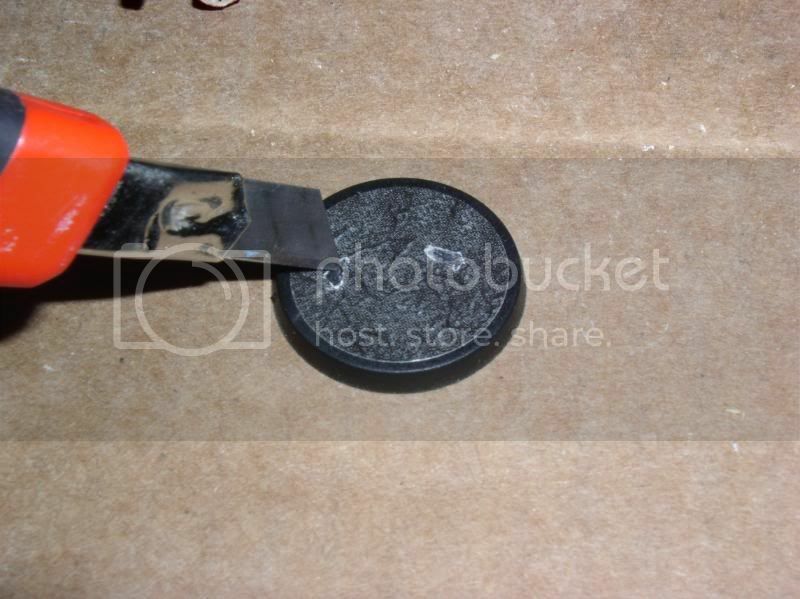 I clean up the bottom of the feet and gently scratch the underside with the knife in order to help get a better bond. 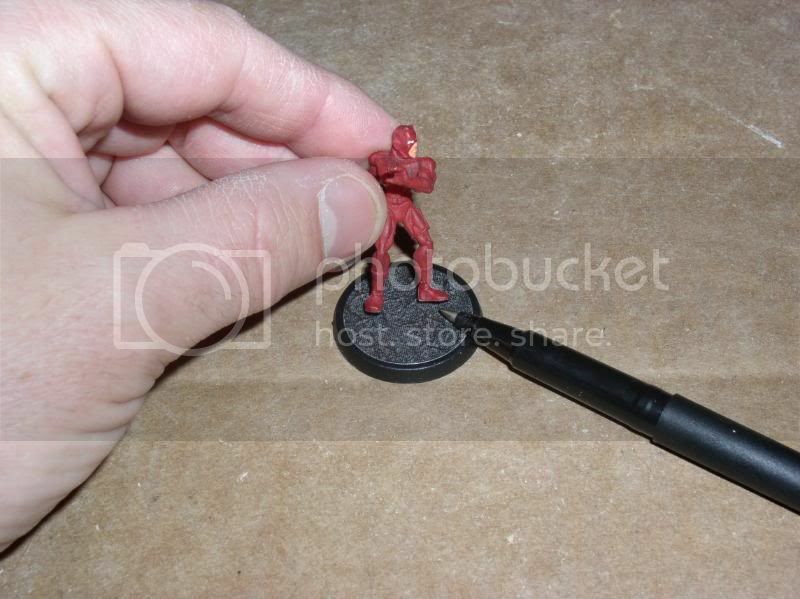 I place the figure where I want him and then tilt him backward a little and make a mark with the fine tip marker where his feet need to go. 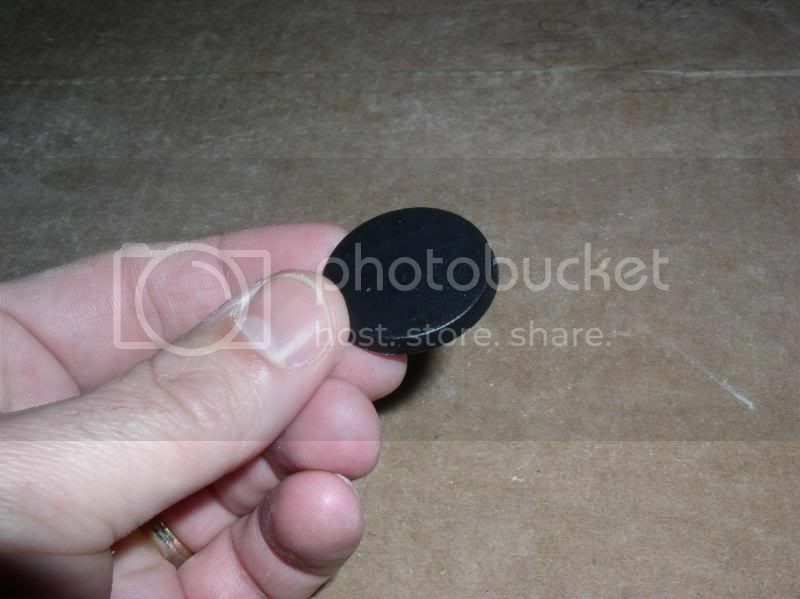 I then use my knife to cut around the mark. After cutting the first one, I usually place the figure back on the base to double check to make sure the other foot will still line up correctly or if I have to make slight adjustments with my cutting. After I get the second mark cut out, I clean up any loose sticker left there and then I scratch the black footprints with my knife, again, this is to help in bonding. I apply a drop of glue to each footprint and then place the figure, careful to pretty much get him right where I want him because there won't be much time to move him around. I then hold him there for about 30 seconds and I'm done. Now for flying figures, I have done different things depending on the figure and how I think I need to do it that will work best for the figure and for me. 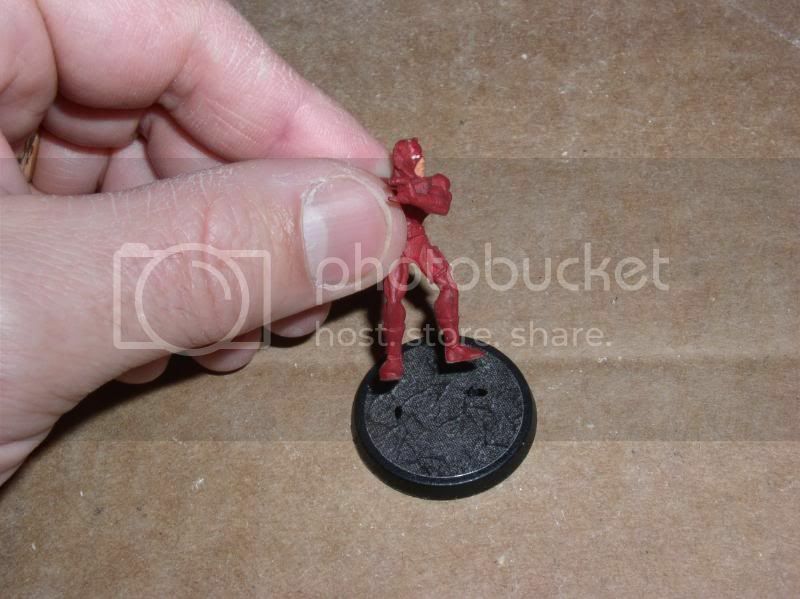 Flying figures will have a clear plastic stand that they are attached to (Sorry no pix, but it's easy to figure out) that stand up from the Heroclix base. 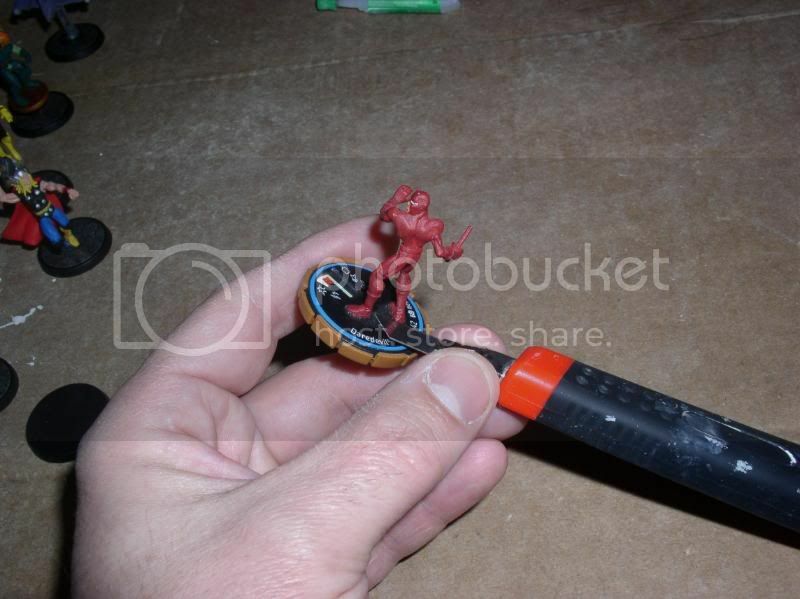 If I will remove the figure from the clear stand that the peg connects to, I will use the figure to help me mark a spot on the un-stickered base. Depending on the figure, some will line up in the middle and some might line up closer to the edge of the base. 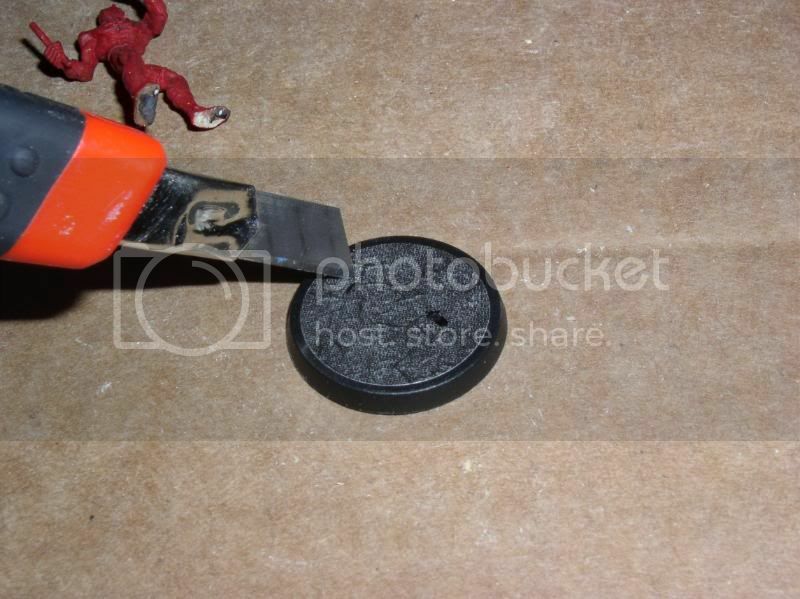 I chose to remove Jack O' Lantern from the clear peg base and attach his pegged hover disc directly to the new base. I used him to mark the spot where his peg will go and then I used my razor knife to make the hole. I use the knife because the pegs can be of slightly different sizes and I want a snug fit. So before I make the hole too big, I'll keep checking to see if the peg fits into it and so on until I get the snug fit that I want. 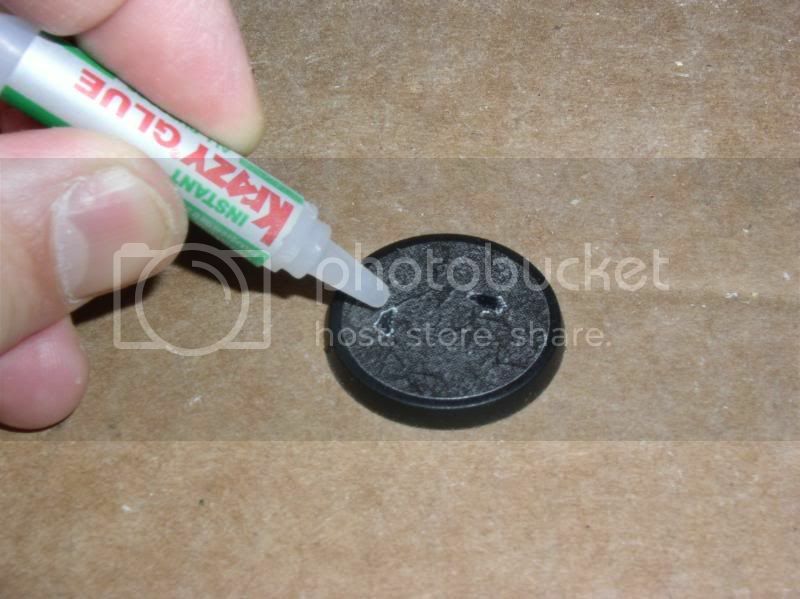 I make the hole prior to applying the base sticker so that I don't mess up the sticker. 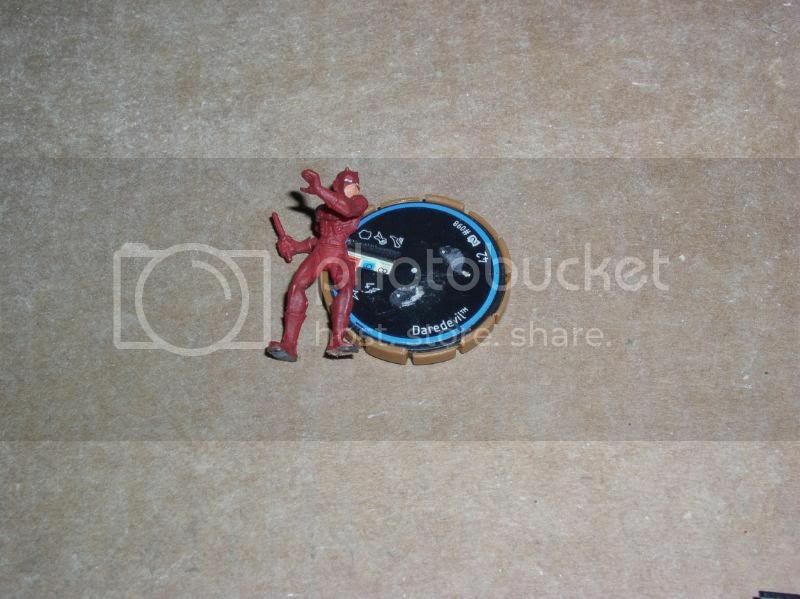 Once the hole is made and the fit is right, I apply the sticker and then use my knife to poke a hole in the sticker where the hole is and then I insert the figure. 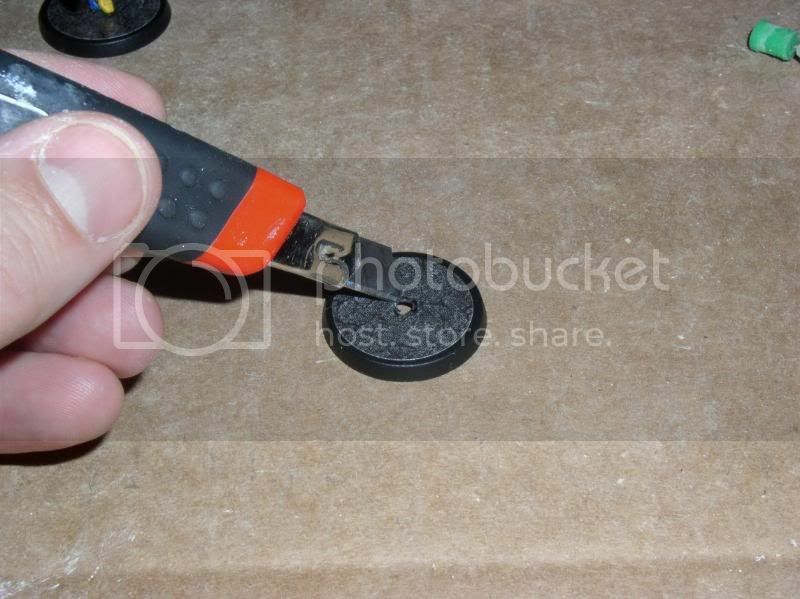 I can either glue the peg into the hole or not depending on the fit and the figure. 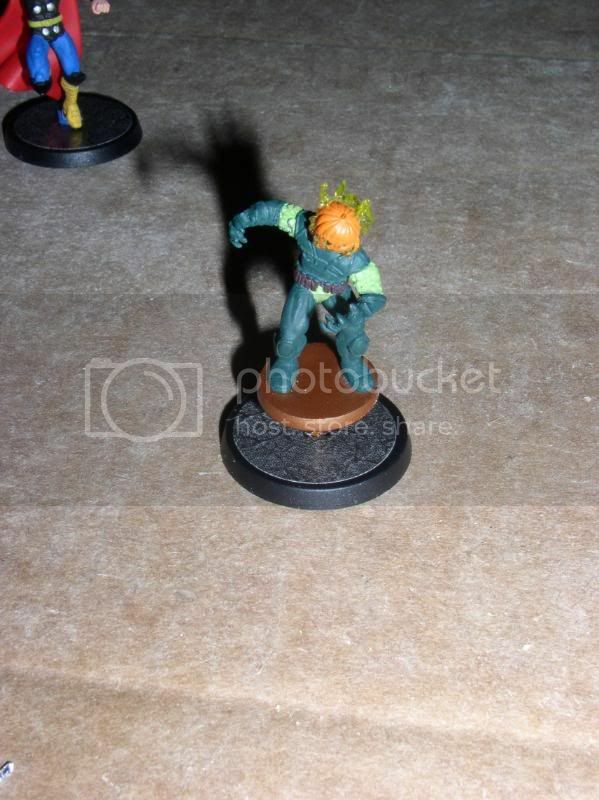 Here are some other examples of some flying figures and how I chose to re-base them. The Storm one for example had the peg on a foot that was higher than the other one and the bottom of the peg just barely went past the other foot. I didn't think that would have been a good secure bond, so I had cut off the clear plastic peg stand and applied it to the new base, following the correct steps for attaching it. I thought the Hobgoblin's glider might not look right sitting directly on the base, so I kept the clear plastic stand, I did the same for Black Knight, though I think I lowered the clear plastic stand. 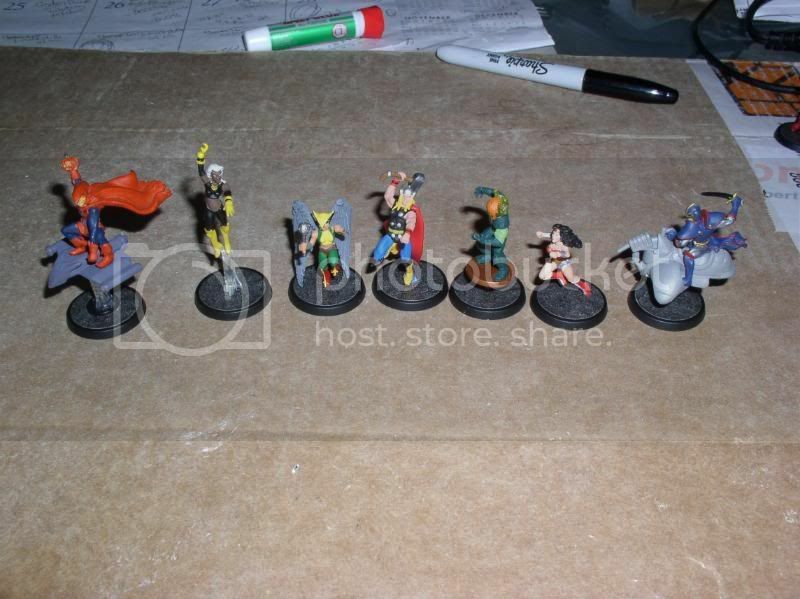 Hawkgirl, Wonder Woman and Thor had good peg position to allow for me to insert their peg directly into the base. Just for the heck of it, I figured I'd show how I store most of my Superhero figures. 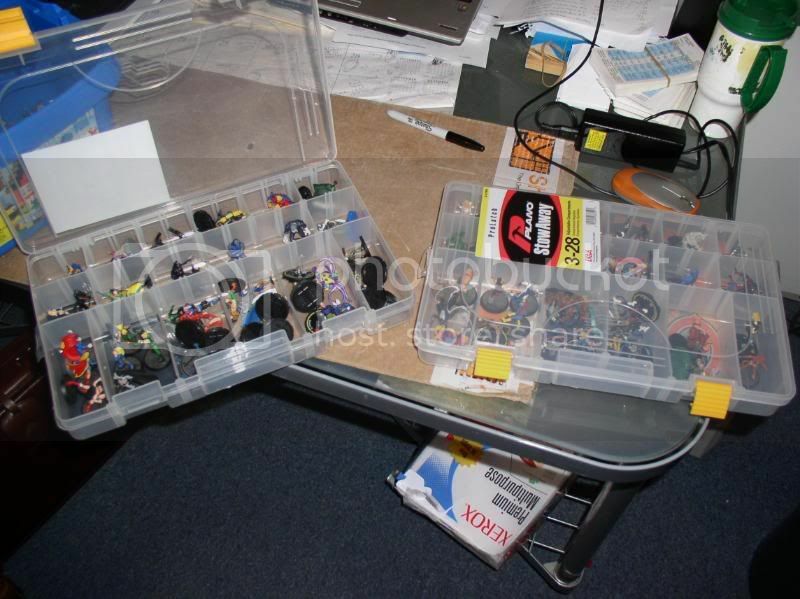 I believe I got these Plano boxes at Home Depot or Lowe's and they weren't very expensive. Well that's it. 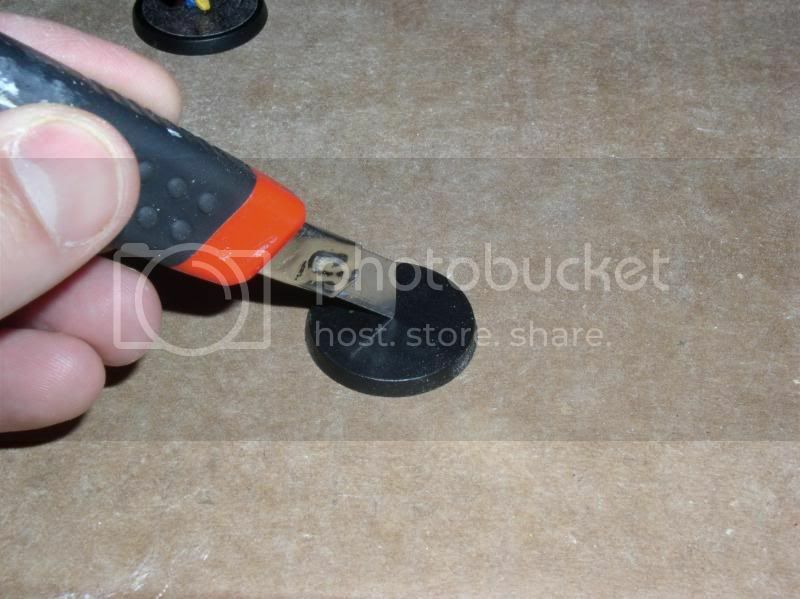 I hope this helps anyone that's interested in re-basing Heroclix (or other figures) onto new bases that are perfect for Heroscape. 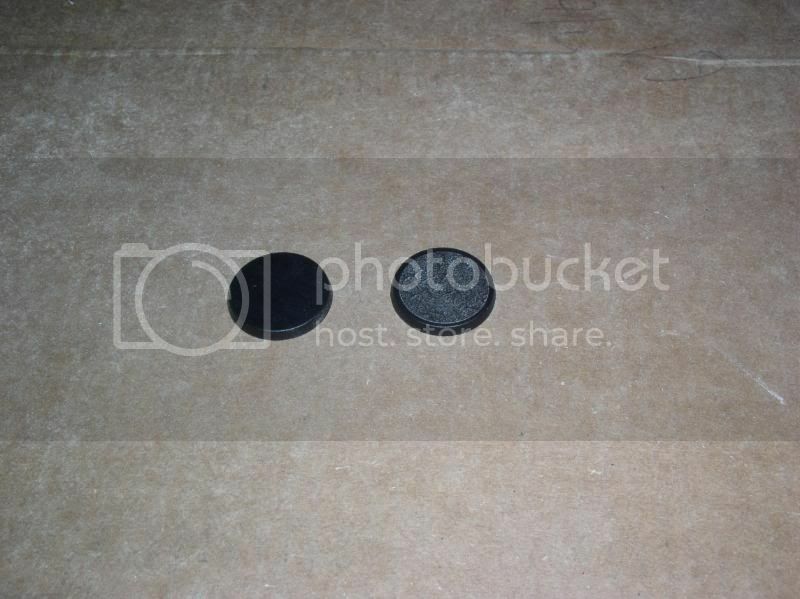 Last edited by Hahma; November 4th, 2010 at 07:50 PM.